Journal of Nanjing Agricultural University, 2019, 42(2): 261-269. 崔梦杰, 郭凤菲, 王晨, 等. 葡萄VvAGL11和VvAGL15基因的鉴定及其在赤霉素诱导葡萄无核果实发育过程中的作用[J]. 南京农业大学学报, 2019, 42(2): 261-269. Abstract: [Objectives] The paper aimed to study the role of VvAGL11 and VvAGL15 in development process of seedless grape berry induced by gibberellin. [Methods] Full-length of cDNA of VvAGL11 and VvAGL15 was obtained from 'Kyoho'. 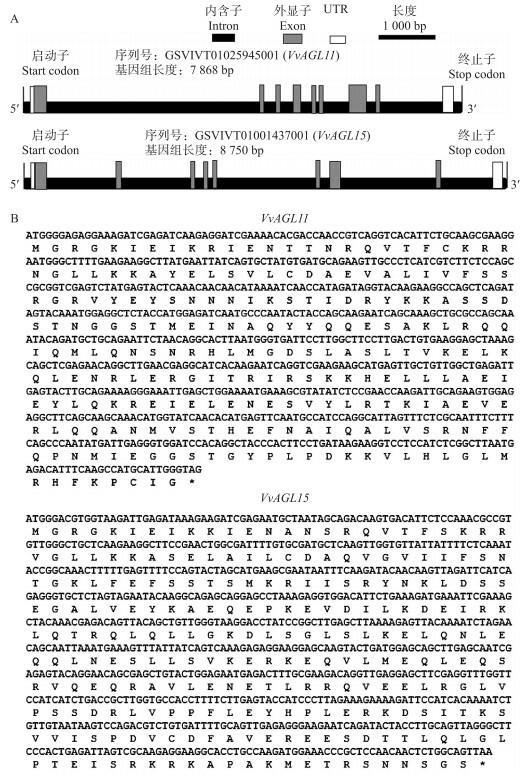 Potential function of VvAGL11 and VvAGL15 was predicted by analyzing its promoter motif elements. Spatio-temporal expression level of VvAGL11 and VvAGL15 in grape berry from control and GA3 treatment groups was detected by RT-qPCR. 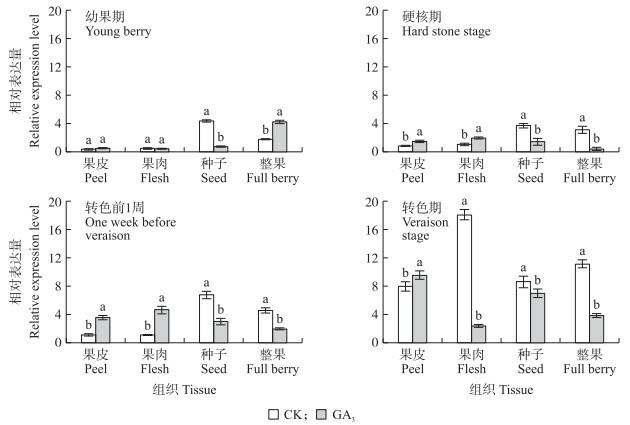 [Results] Seedless grape berries were induced by GA3 treatment which can significantly elongate grape berry and clusters and thickening spike stalk. At the same time, cDNA full-length of VvAGL11(MG581423) and VvAGL15(MG581424) was identified. Both VvAGL11 and VvAGL15 contained conserved domains of MADS-MEF2-like and K-box, belonging to the MADS-box transcription factor family. The main secondary structural elements were α-helix and random coil, and these two genes were mainly located in the nucleus. The protein structure was conservative. Promoter cis-acting element analysis showed that both of them contained the gibberellin-responsive elements and the elements required for endosperm expression. RT-qPCR results showed that VvAGL11 and VvAGL15 expressed highly in grape stone hardening stage and veraison stage. GA3 treatment could significantly down-regulate the expression of them only in the seed region. 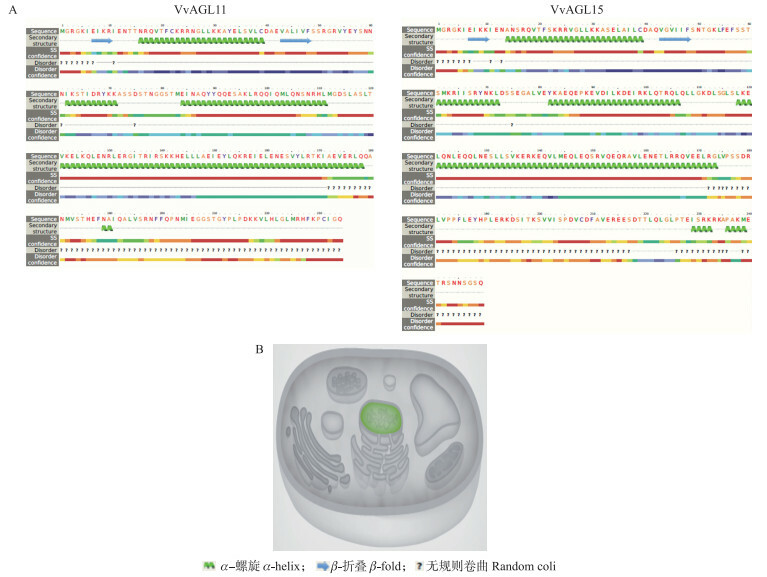 [Conclusions] VvAGL11 and VvAGL15 were identified as members of the MADS-box gene family. GA3 can inhibit the development of seed by down-regulating the expression of VvAGL11 and VvAGL15. 图 1 ‘巨峰’葡萄不同生长发育期的横切面 Fig. 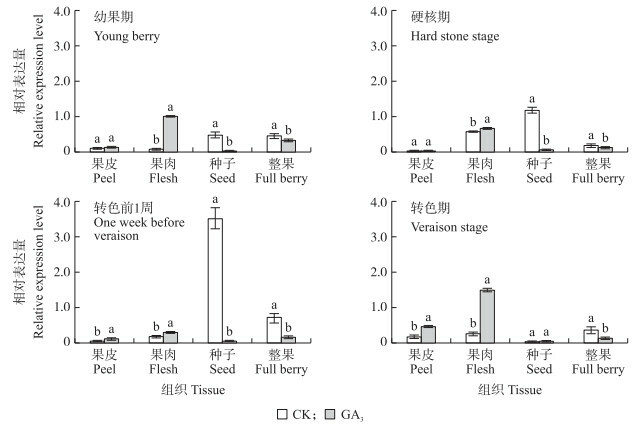 1 Longitudinal section of'Kyoho'grape berry at different development stages CK:对照Control; GA3:赤霉素处理Gibberellin treatment.下同。The same as follows. Note:Different small letters indicated significant difference at 0.05 level between treatments. The same as follows. A. Schematic diagram of GSVIVT01025945001 and GSVIVT01001437001 genome sequences; B. The ORF sequence and amino acid sequence of grape VvAGL11 and VvAGL15. TAG和TAA为终止密码子。TAG and TAA are the stop codon. 图 3 葡萄AGL11和AGL15与其他物种的系统进化分析 Fig. 3 The phylogenetic relationships of AGL11 and AGL15 of grape and other species Me:木薯Manihot esculenta; Hb:巴西橡胶树Hevea brasiliensis; Jc:麻疯树Jatropha curcas; Tc:可可Theobroma cacao; Vv:葡萄Vitis vinifera; Cs:柑橘Citrus sinensis; Gh:陆地棉Gossypium hirsutum; Cp:木瓜Carica papaya; Mc:苦瓜Momordica charantia; Ai:花生Arachis ipaensis; Gm:大豆Glycine max; Cc:木豆Cajanus cajan; Fa:草莓Fragaria× ananassa; Pb:梨Pyrus× bretschneideri; Pp:桃Prunus persica; Pm:青梅Prunus mume; Si:芝麻Sesamum indicum; Jr:核桃Juglans regia; Cm:甜瓜Cucumis melo; Md:苹果Malus domestica; At:拟南芥Arabidopsis thaliana; Rc:蓖麻Ricinus communis.下同。The same as follows. 陈俊伟, 谢鸣, 吴江. 遗传工程无籽果实原理及其研究进展[J]. 浙江农业学报, 2003, 15(6): 365-371. 崔梦杰, 王晨, 张文颖, 等. 无核葡萄研究进展[J]. 植物生理学报, 2017, 53(3): 317-330. Cui M J, Wang C, Zhang W Y, et al. Progress in the study of seedless grapes[J]. Plant Physiology Journal, 2017, 53(3): 317-330 (in Chinese with English abstract). 孙其宝, 俞飞飞, 孙俊. 葡萄无核化研究进展[J]. 安徽农业科学, 2004, 32(2): 360-362. 肖祥希, 李明, 邱栋梁. 果实无核机理研究进展[J]. 经济林研究, 2009, 27(2): 104-110. Alvarezbuylla E R, Liljegren S J, Pelaz S, et al. MADS-box gene evolution beyond flowers:expression in pollen, endosperm, guard cells, roots and trichomes[J]. Plant Journal for Cell & Molecular Biology, 2010, 24(4): 457-466. Becker A, Theissen G. The major clades of MADS-box genes and their role in the development and evolution of flowering plants[J]. Molecular Phylogenetics & Evolution, 2003, 29(3): 464-489. 王文举, 马治国. 赤霉素和链霉素及促生灵促进巨峰葡萄果粒增大和无核的试验[J]. 落叶果树, 2003, 35(4): 43-44. 刘佳, 刘晓, 陈建. 四川地区赤霉素和链霉素处理对巨峰葡萄无核化及果实发育的影响[J]. 西南农业学报, 2011, 24(1): 220-224. 陈发河, 蔡慧农, 冯作山, 等. 葡萄浆果发育过程中激素水平的变化[J]. 植物生理与分子生物学学报, 2002, 28(5): 391-395. Chen F H, Cai H N, Feng Z S, et al. Changes of hormone levels during the development of grape berries[J]. Journal of Plant Physiology and Molecular Biology, 2002, 28(5): 391-395 (in Chinese with English abstract). 张彦苹, 王晨, 于华平, 等. 适于葡萄不同组织RNA提取方法的筛选[J]. 西北农业学报, 2010, 19(11): 135-140. Zhang Y P, Wang C, Yu H P, et al. Screening of RNA extraction methods for various grapevine organs and tissues[J]. Acta Agriculturae Boreali-occidentalis Sinica, 2010, 19(11): 135-140 (in Chinese with English abstract). Yang Z, Li C, Wang Y, et al. GhAGL 15s , preferentially expressed during somatic embryogenesis, promote embryogenic callus formation in cotton(Gossypium hirsutum L.)[J]. Molecular Genetics & Genomics, 2014, 289(5): 873-883. 董庆龙, 冀志蕊, 迟福梅, 等. 苹果MADS-box转录因子的生物信息学及其在不同组织中的表达[J]. 中国农业科学, 2014, 47(6): 1151-1161. Cai Y Q. Cloning and epression of SERK and sme other somatic embryogenesis-related genes during somatic embryogenesis in Dimocarpus longan Lour[D]. Fuzhou: Fujian Agriculture and Forestry University, 2011(in Chinese with English abstract). Wang F. Mechanism of embryo abortion in stonespermic seedless grape and embryo rescue with seedless grape[D]. Yangling: Northwest A &F University, 2002(in Chinese with English abstract).